2019 Kick-off Party: Saturday, February 2, 2019. Get $5 Early Bird Discount Tickets at Eventbrite! (Save vs. the regular $8.00 price at the door). Early Bird sale ends Saturday, February 2, 2019 at 5:00PM. The December “BEETLEBUM” party was so much fun… thanks to everyone that came out! A special thanks to our December 1st guest DJ Twig The Wonderkid. Mark your calendars for February 2nd for the next edition of the electrifying Britpop night in Brooklyn: “BEETLEBUM,” occurring bi-monthly at the stylish live music venue SAINT VITUS. 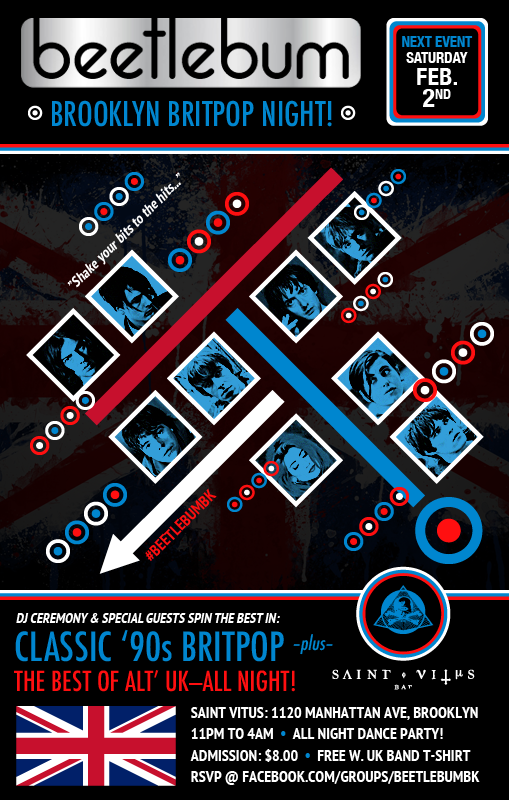 The best Britpop party celebrating “Cool Britannia” in the tri-state, we’ll be spinning your favorites until we’re shut down! 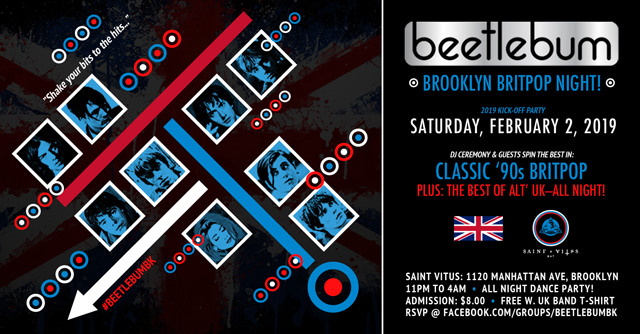 “BEETLEBUM” is your home for Britpop in Brooklyn & NYC, so get ready for another epic night! Saturday, February 2, 2019 — 11:00 p.m. to 4 a.m.